In an ideal situation, I would have booked to dine and stay at Mr Underhill’s in Ludlow when I went there with Russell, Darcy and Bob. However, our visit coincided with the Ludlow Medieval fayre at the end of November – managing to secure a table was already a pure stroke of luck; but my fortune did not extend to getting the rooms. It appeared that all hotels in and around Ludlow were full also. So we ended up staying in Tenbury Wells – not ideal to find our way round this part of the country on a cold dark November evening with the GPS almost non-functional. After getting a bit lost driving in Ludlow, we parked the car near the castle and then walked down to the restaurant. We got there just before 8pm, and were greeted warmly by Judy Bradley, and then led to the table straight away. 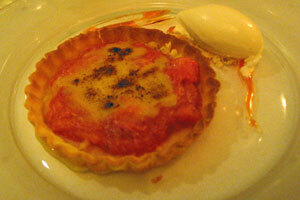 The restaurant was buzzing – with no empty tables and everyone in good spirit. 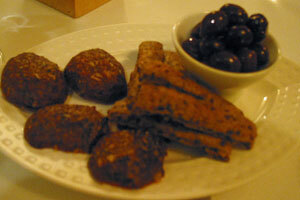 To go with our aperitif (kir royale as usual), we were presented with a trio of olives (marinated, gougeres & flatbreads). There was only one set menu which was fine – Judy phoned me earlier in the day and checked if we would have any problems to the dishes (of course not!). We also asked for recommendation on the wine and Judy suggested half a bottle of albarino to start – it was a good choice. 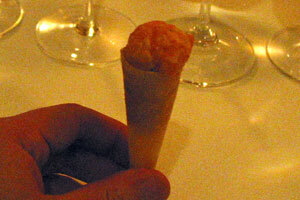 The first course was a cone of marinated smoked salmon – the salmon was beautifully marinated and filled the whole cone. It was a very promising start to the meal. 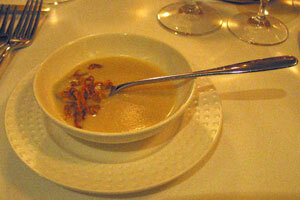 The next course was white onion velouté with crispy shallot – the soup was full of onion flavour, and the sweetness and creaminess of the soup contrasted well with the texture of the shallot. 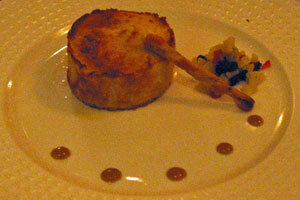 The third course was duck liver custard 2010 with sweetcorn cream and lemongrass glaze. Every mouthful of this made me want to eat more. 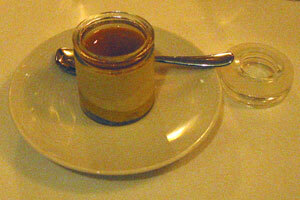 The duck liver custard was already heavenly delicious on its own,, but it was elevated to a new level with the intense sweetness of the sweetcorn at the bottom of the little jar. 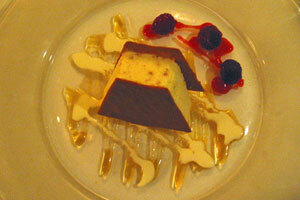 It was an extraordinary dish. Bob, on his anti-plastic-straw campaign (yes, he hated plastic straws in drinks), said “you can put a plastic straw on it and I’d still like it”. Not that you could have enjoyed this with a straw anyway! 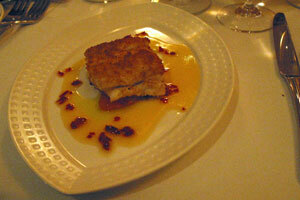 The fish course was hake on fondant tomato with chorizo & orange – the fish was very fresh and perfectly cooked, with a fine balance of tomatoes, chorizo (without going over the top with the quantity like some other places) and a fantastic orange sauce. At this point of the meal we enjoyed everything so much that we all agreed that we could have had a big plate of every dish on its own without any hesitation. The meat course was slow roasted fillet of Mortimer Forest venison with venison jus, gin and orange vinaigrette, and girolles and baked potato mash. The venison was very tender, and went so well with the sauce that Darcy even forgot that the wine was there (now that’s a first!). The dish was not too heavy on the stomach either. 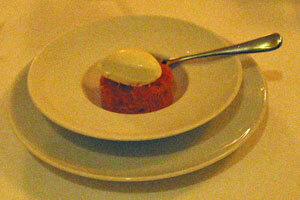 The pre-dessert was plum ‘sponge’ with star anise ice-cream – the “sponge” was a very refreshing plum granita. Overall a very pleasant taste. Russell went for the Highland parfait with flapjack wafer, with Scottish oat praline, caramel and drambuie – he was disappointed with this one as he did not think it was anything special. For me, being the adventurous one, I went for a dessert that was billed as “part savoury, part dessert” for those undecided: Oakly Park rarebit with anchovy sauce and delicate piccalilli. 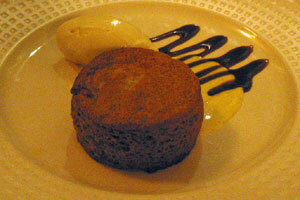 Interesting concept but it was definitely nowhere near a dessert. At best it could be classed as a cooked cheese course. 10/10 for the idea, but it’s not something I enjoyed that much. We were one of the last customers to leave the restaurant, and before we left, we were given some shortbread biscuits to eat “on the road” – not that we needed them that evening, but it was something that we enjoyed the next day and reminded us of what an enjoyable meal it was. 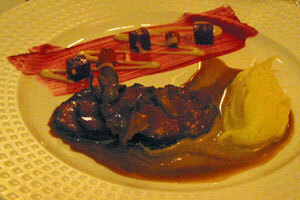 We agreed that it would be one of the restaurants we’d make a special effort to go back to.